The EU Referendum campaign officially began on April 15 and the voting in the Referendum itself takes place on June 23. Despite this, the government pre-empted the campaign, and its spending limits, by producing a 16-page booklet with a print run of 27 million, financed by £9.3m of public funds, sent to households across England, urging people to vote for Britain to remain in the European Union. The mail-out in Scotland, Wales and the north of Ireland is being delayed until after the elections to the devolved bodies. The spending consists of nearly £6m on printing and delivering the leaflets, and nearly £3m on targeted digital promotion of an online version. Such was the outrage that a petition attracted more than 200,000 signatures, double the threshold for a debate in Parliament, which is due to be held on May 9. On April 13, the Electoral Commission, following the EU Referendum Act 2015 and the Political Parties, Elections and Referendums Act 2000, designated the lead organisations for the “Remain” and “Leave” campaigns. There was just one contender for “Remain”, called “The In Campaign”, but several for “Leave”. Choosing such a designated organisation is no small matter, since £600,000 of public funds is at stake, as well as a free distribution of information to voters, referendum campaign broadcasts and free use of certain public rooms. “Vote Leave” was chosen by the Electoral Commission as “adequately represent[ing] those campaigning” for leaving the EU. Thus the people are being asked to participate in the referendum with no say in setting the agenda. The “official” remain and leave campaigns are headed by establishment figures, and the people are being asked to line up behind arguments which give the people no role in decision-making. What are the issues? What is at stake? The working class and people must reject “Project Fear”. Passions are being raised to create splits and divisions amongst the people, rather than engaging the people in a serious debate to look at the facts and arguments and reach a conclusion. Such a conclusion takes into account matters of principle, and is not confined, as the establishment figures would have us believe, to what “benefits the British people” but takes into account what will open a path which favours the working class and people of England, Scotland and Wales, and defends the rights of all, acting as one with the working people of Europe, and defending the rights of the workers who are made to suffer from the “free movement of labour”, which is “free movement” for the EU barons, but forced movement for the workers. That is not to say that a stand should not be taken. For the problems of the economy to be solved, for example, and a new direction taken, Britain cannot remain in the EU. For that matter, from the problems that Greece faced from the Troika of the IMF, the European Central Bank and the European Commission, it is clear that the EU, with its concentration of power and wealth in a few hands, is a cause of the problems of the economies of European countries, not a solution. 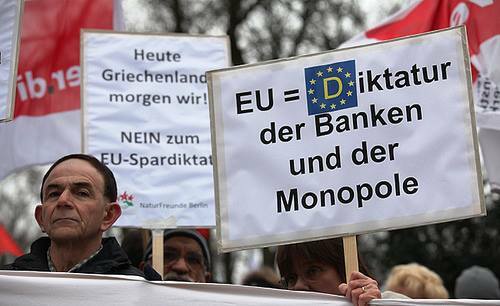 In other words, the EU of the monopolies is an EU of the austerity agenda and neo-liberalism. Working people need and aspire to be in control of their own lives. The EU is a block to this aspiration, as it strengthens the power of the global monopolies, and further disempowers the people. It is also a further threat to peace and a factor for war, contrary to the propaganda that it has ensured peace in Europe. It cannot be otherwise when the big powers of Europe are pro-war, not anti-war governments. The aggressive US-led NATO alliance is also strengthening its co-operation with the EU, notably in their moves to encircle Russia. Arguments that the British government could have persuaded the European Union to enable them to do more to save the steel industry in this country, despite the EU dictate that forbids state rescue and restructuring of “failing” industries, particularly steel, are also clutching at straws. What is needed is a public authority with the power to invest, set prices, and determine the direction of the economy and the steel industry in particular. This runs contrary to all the EU stands for, making a fetish of “free competition”. In short, it is the working class which must become organised as the pro-social force to change the direction of the economy and society. It is a cruel joke to suggest that workers’ rights are guaranteed by the EU. Workers and their defence organisations have had to fight to affirm these rights, which still remain under severe attack, for instance from the notorious Trade Union Bill. Has EU law guaranteed the rights of Junior Doctors? 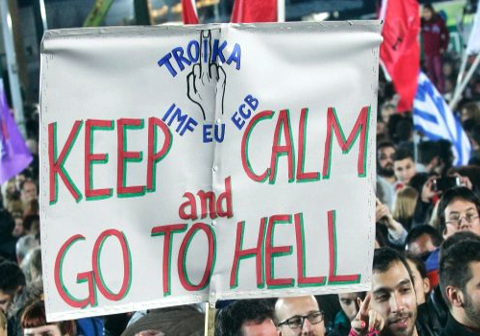 In fact, untrammelled monopoly right is what underlies the aims of the EU, as the people of Greece know to their cost. The nuit debout demonstrations of working people in France are also a manifestation that rights have to be fought for. The conclusion is that it is the working class and people themselves who must be empowered to guarantee their rights and the rights of all. It is disarming the workers to suggest that they should entrust their fate to EU laws and regulations. In this sense, rather than lining up behind the “official” Remain and Leave campaigns, the working class must develop a powerful movement with its allies in society to become the guarantors of an independent, sovereign economy, trading with a view only for mutual benefit of both partners, rejecting the neo-liberal agenda, and building a strong manufacturing base and a self-reliant agriculture for the benefit of the economies of Scotland, Wales and Britain as a whole. 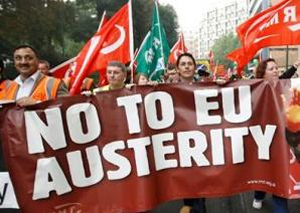 No to EU Austerity! Yes to the Sovereignty of Nations! Britain Must Leave the EU! For an Alternative Where the Working People Set the Agenda!